LiveCode LessonsData GridLiveCode Data Grid Using The Built-In Field EditorHow Can I Edit The Text as UTF-8, UTF-16 or HTML? The default Data Grid behavior when editing cell contents is to use the text property of the cell as the default value to be edited. This lesson will show you how to provide a specific value for the Data Grid to use as the value to edit. 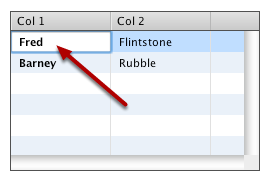 Assume you have a column in your table that displays text with some styling. 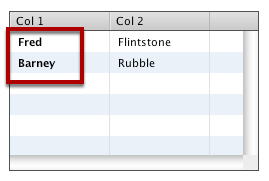 In this example the name in column 1 is bold. When you edit the content of the cell the formatting is lost however. This is because the Data Grid edits the text property of the field by default. You can change the default value of that the field editor uses by setting a value of the dgTemplateFieldEditor property of the Data Grid. You set the property before calling EditFieldText. Other properties you can set include "rtftext", "text", "unicodetext" and "utf8text". 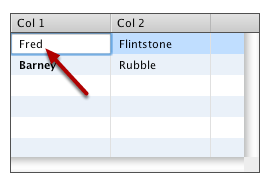 Here is the result of using the example code above in the custom column behavior. Notice how the text being edited is bold. Prev: How Can The User Edit Field Content in a Data Grid Form? Next: How Can I Select The Text in the Edit Field When It Opens?